Home>Vehicles>1987 Pontiac Formula 350 Firebird...ONLY 14 ORIGINAL MILES....NOT A MISPRINT!!! 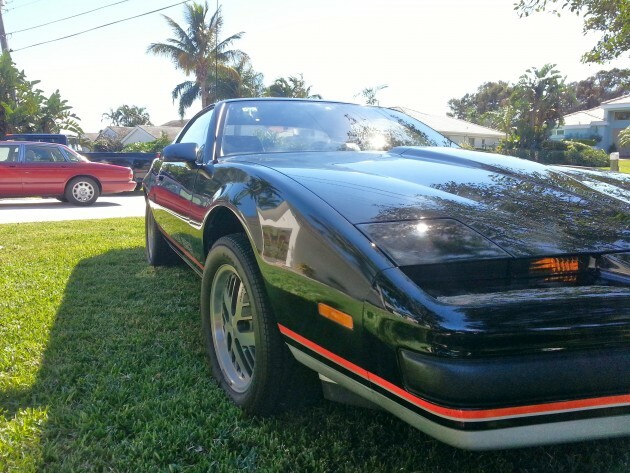 1987 Pontiac Formula 350 Firebird…ONLY 14 ORIGINAL MILES….NOT A MISPRINT!!! Hello and Thank You for checking out our latest Pontiac Formula 350 Firebird for sale by The Motor Masters! You are looking at a BRAND NEW 1987 Pontiac Firebird Formula 350 with only 14 ORIGINAL MILES!! That’s right you read that correctly, only 14 MILES…..NOT A MISPRINT!!! Black with Black Interior. It’s probably the Lowest Mileage Third Generation Firebird on the planet!! It was purchased in February 1987 with plans to turn it into a NHRA drag racing Super Stocker. However the project was shelved and the car has been in heated/air conditioned storage since then for the last 24 years. Built in 1/87, this car was never prepped by the dealer. It was taken directly off of the Anchor Motor Freight Truck, put on a trailer, and parked in a garage. It’s never been rained on, it’s RUST FREE, still has all the Original Dealer Plastic on the seats, the Monroney Sticker, Original Build Sheet, all other stickers and OEM manuals, and it has never been on the road. Because it was bought to be a race car it doesn’t have A/C, or power windows & locks and has the Original Stock AM ONLY Radio (VERY RARE). Has 3:40 Posi Rear with Road Rally Suspension. Original Goodyear Gatorback Tires with no dry rot and it’s been under a car cover for all of its life. Powered by the L98 350 5.7 TPI Engine. It’s one of approx. 1,100 Firebirds built with this engine. Starts right up, all systems work perfectly, only non-original part on the car is the battery which has been replaced by the correct AC Delco part number for the car. Also replaced was the Fuel Pump. FOLKS, YOU WILL NEVER COME ACROSS A UNIQUE VEHICLE LIKE THIS IN THIS CONDITION!!! A TRUE BARN FIND AND TIME CAPSULE!!!! ALL PICS OF THIS CLASSIC CAN VIEWED ON OUR FACEBOOK FAN PAGE AND THIS LISTING! ALSO YOU CAN SEE SOME AS YOU SCROLL DOWN!! ALSO ON MY FACEBOOK FAN PAGE IS A DETAILED VIDEO OF THIS FINE CLASSIC!!! SO IF YOU HAVING BEEN LOOKING FOR A TRUE BARNFIND PONTIAC FORMULA 350 FIREBIRD, THIS ONE IS IT!!! CALL US TODAY!! !